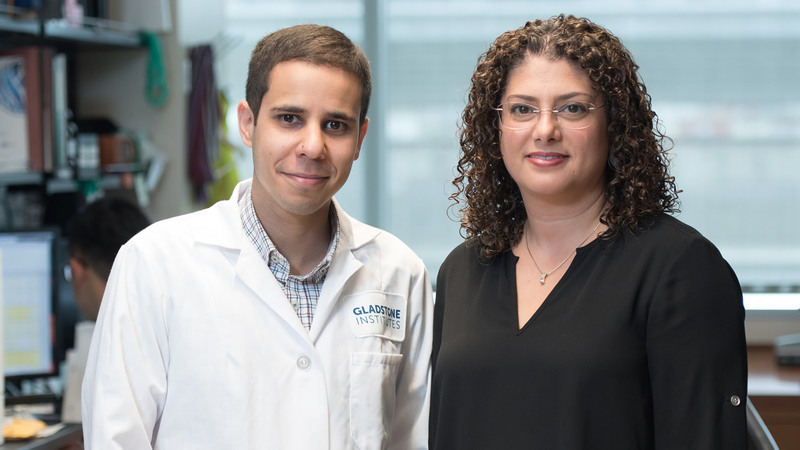 Shomyseh Sanjabi (right) and Hesham Shehata (left) discover how to enhance the longevity of cells that kill tumors and infected cells. Sanjabi’s study offers a new way to increase the number, survival, and function of memory CD8 T cells, which could provide better protection against tumors and pathogenic infections. The paper “Lack of Sprouty 1 and 2 enhances survival of effector CD8+ T cells and yields more protective memory cells” was published by PNAS (Proceedings of the National Academy of Sciences of the United States of America) on August 20, 2018. The research was supported the National Institutes of Health and the UCSF–Gladstone Center for AIDS Research. Other contributors to the study include Shahzada Khan from Gladstone, as well as Elise Chen, Patrick Fields, and Richard A. Flavell from Yale University.